Conan Exiles is the latest in the number of video games to utilize Robert E. Howard’s iconic character Conan the Barbarian and the Hyborian Age in which he resides. It’s also the second Conan game developed by Funcom, after the demise of their once long-running MMORPG Age of Conan. But unlike Age of Conan, Exiles is an open-world survival game akin to the likes of Rust or Ark: Survival Evolved. Conan Exiles is set in what is unsurprisingly called the Exiled Lands. Players start of in the middle of the desert naked, crucified, and left to die until Conan himself comes by to cut you down from your cross and set you free into the game’s harsh world. Players can then take on tasks meant to help them get accustomed to the game such as eating, drinking, crafting, and exploring the vast map of the Exiled Lands. 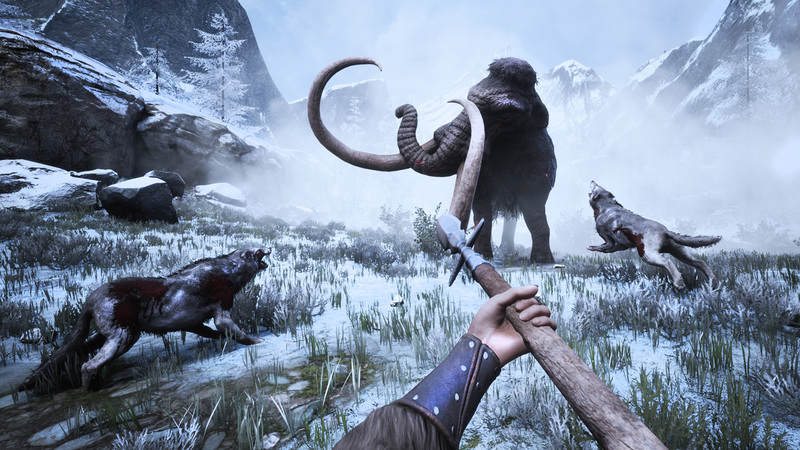 Like any other open-world survival game, Conan Exiles thrives on the amount of exploration players can experience. The Exiled Lands is divided into several areas, each with their own environments and zoology. And there’s really no shortage of things to do in Conan Exiles. There’s crafting, hunting for both food and resources, building shelters and fortresses, slaying monsters, waging war against other players, and so much more. While the game does have an offline single-player mode, there really isn’t much to do given that the game has no formal narrative and some of its activities are just better accomplished with a group. The bulk of the game’s enjoyable experience truly resides in its online multiplayer where people can join one of the many official or player-created servers, with each server featuring different settings for resources, death, and PVP/PVE. 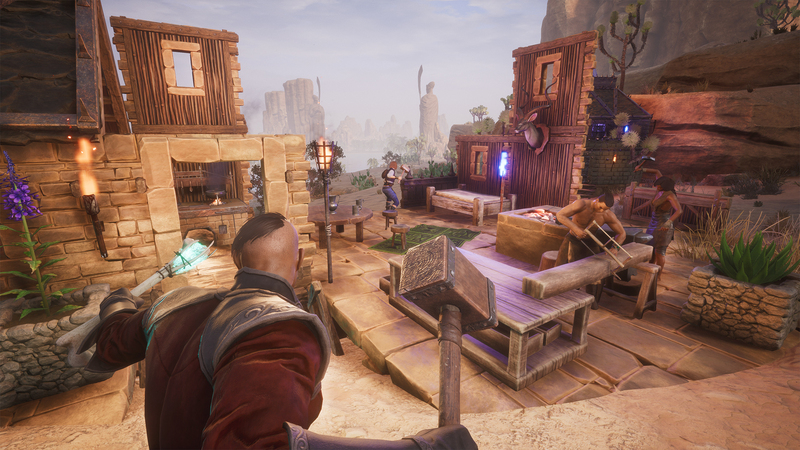 Playing Conan Exiles with friends or even a group of friendly strangers is definitely the more exciting way to experience the game. Finding new locations, exploring dungeons, fighting bosses, and discovering treasure are all made more interesting and accessible when playing in a group. Players can also choose to be more competitive and attempt to take down other players’ strongholds. Despite having to do quite a bit of fighting in Conan Exiles, combat is sadly the game’s biggest weakness. While the game’s combat system isn’t significantly bad, it also isn’t spectacular in any way and actually falls below run-of-the-mill action game combat. There isn’t much depth in the game’s combat system and tends to become quite boring and/or tedious. But it all isn’t remarkably unexpected when compared to similar titles in the genre. On the other hand, crafting is the basket the game decided to put most of its eggs in. Essential to both surviving and succeeding in Conan Exiles, the crafting system is almost as vast as its map. While the game’s crafting starts out pretty simple, it quickly opens up to both an incredible amount of crafting opportunities as well as an intense grind for collecting materials. Crafting is definitely where most players will spend the bulk of their time with the game. 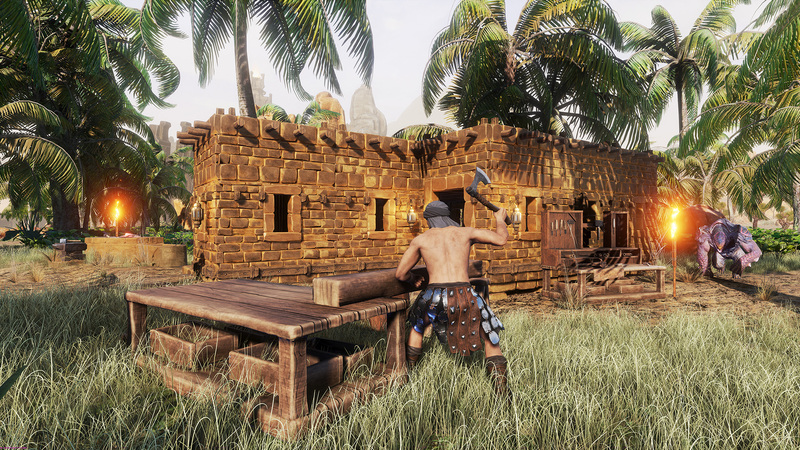 Further into the game, players will be able to construct their own fortresses which they can populate with NPCs that server quite a large variety of purposes. These Thralls can defend player fortresses, craft materials, and more. Players will then have to defend their fortresses against other players or what the game calls a Purge, a triggered event when players gain enough experience where a group of NPCs attack the fortress. Conan Exiles definitely has a lot to offer for fans of open-world survival games. And with its wide set of established lore, thanks to the Conan franchise, there’s definitely a lot of interesting things for players to discover and experience in the game. And while does tend to become repetitive, especially when gathering materials for crafting is concerned, the potential for new and exciting adventures is plenty. Hopefully the developers continue to improve the game and add more content to keep it fresh and exciting. Conan Exiles is definitely one of the better titles in its genre and those who still haven’t fallen out of love with survival open-world games like it should give it a shot.